A typical fairway with mown stripes. A fairway is a closely mown area where tee shots are designed to land. 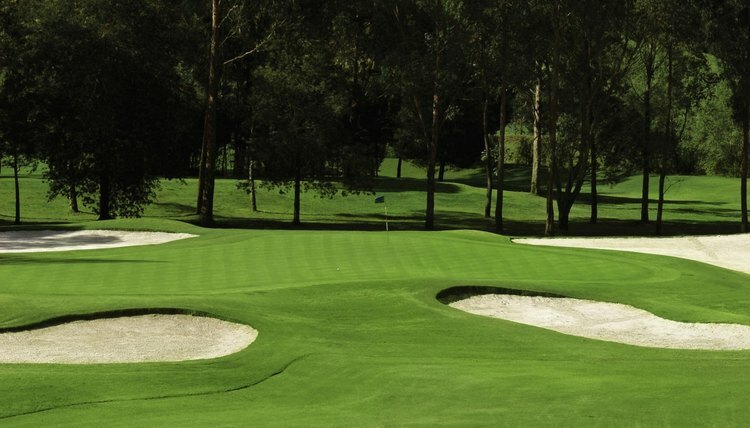 The Rules of Golf cover the term fairways as areas "through the green." Fairways are cut by specially maintained mowers and often reflect linear or checkered patterns for aesthetic impact. 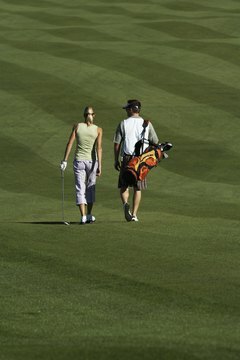 A player and her caddie walk down a well-groomed fairway. Geography and maintenance affect the types of fairway grasses that golf course builders choose. Cool weather in parts of the country make certain types of grass better suited for use while warm weather and dormancy in other areas of the country affect fairway grasses. Weather in the Northeast, for example, would not permit types of grass that need constant warmth to thrive, while dry, hot conditions in the South also determine the type of grass that would thrive in fairways. And there are even conditions such as heat, moisture and winter damage that make a combination of grasses the best fit. 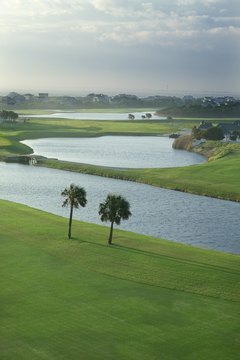 Palm-tree dotted golf courses in the South usually include Bermuda grass on fairways. Heat and dry conditions in the South play a large role in fairway conditions, so a durable grass such as Bermuda is best-suited in that region. "Bermuda is about as durable as you can get," Darrin Bevard of the United States Golf Association's Green Section Northeast Regional office in Glen Mills, Pennsylvania. "You can't use Bermuda in the Northeast for the most part due to the seasons." Kentucky bluegrass and perennial ryegrass are also found in the South. Perennial ryegrass and poa annua are best suited to be used in the Northeast, but there are also other types which may be used in combinations. "It's a breakdown between cool and warm season grasses," said Bevard. "You'd have some bent grass, poa annua, perennial ryegrass. Maybe some fescue as well." Cool, damp weather tends to protect fairways as the season progresses into the summer months. But ice and snow damage from brutal winters may also produce barren or discolored areas, leading to maintenance-cost issues while repairs are undertaken. Fertilizer costs are demanding and weed control also figures into the maintaining of fairways. Fairways in the West and Northwest have several different grass varieties. Bandon Dunes resort in Bandon, Ore., is a must-play destination for many golfers. Part of a five-course complex on a property overlooking the Pacific Ocean, the resort draws players and raves from throughout the world. Courses wind through sand dunes and natural land, with the Pacific Ocean and its noteworthy rocky formations just off in the distance. The grasses used on its fairways are just as diverse. "Bandon uses fescue and bent, but that's the exception rather than the rule," said Bevard. Some areas on the West Coast also use bentgrass and ryegrass and tangled Zoysia grass is also found.